Two-piece technology For golfers seeking longer and straighter two-piece distance with cut-proof durability. Very soft ball, great for putting and chipping, rolls beautifully, best ball i have ever played. Very nice balls. Long and straight. I'm getting 15-20 yards more than the Top Flite 2000 ES although these are doubled the price. Worth it though, putting is true and doesn't feel too hard. The disadvantage is that it doesn't hold the green very well but I think it' still better than the TF2000. Will use it as my everyday ball now. This is the best Titleist ball I have ever played with and the only one I would consider buying; I've tried the HP line, the other DT's, and the newer NXT distance, which I believe is meant to replace the DT Distance (but is a POS, no better than an $8/15 Intech). It flies very straight, goes as long as nearly anything I've played and is quite durable. I hit one tee shot with it on a 285 yard par four with a highly elevated tee box, and my 3W ended up a couple of yards short of the green, directly in front of the pin; chipped to three feet and made the birdie. I found one and played with it for around 25 holes (which is terrific for me - I rarely go 18 holes without losing a ball). I finally had to replace it after a slight fade got caught by a left-right wind and I hit a cart path, scuffing the ball pretty significantly. It has a good feel, neither too hard nor too soft, and sounds nice ringing off the face of my driver. It chips and putts well, too. I would say it's slightly above average in holding the greens, better than a Pinnacle or Top Flight XL2000, but obviously has less spin than a balata ball. A very good ball and it's a good value (I'm not going to call it a budget ball, as some other guys who shoot in the 90's do who "prefer" their Pro V-1's and A10's - talk about ridiculous - no high handicapper benefits in any way except in status in the eyes of shallow golfers by spending $30-50 on a dozen pro level balls). Great all-round ball. Straight, predictable, with all the spin that an 80''s player really needs. Still prefer the Professional (when I can keep it on the fairway) for the feel. But I use the DT as my "everyday" ball. Literally everything. Callaway clubs good, balls bad. Look, I loved the Professional but the wound ball is dead and we are now forced to find solid core replacements. With approximately six thousand balls on the market, one is forced to stick to brand loyalty. 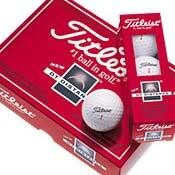 This ball seems to cover all the bases pretty well until Titleist figures out the direction of their ball offerings. Without spending a bunch of money it has enabled me to discover the nuances of two piece technology. I would be interested in trying the HP dist., however, this is pointless as it will probably not be offered next season. Check the Titleist website and see the new NXT line that will swallow most of the fray solid core offerings and all of the wound models. This is a good ball, predictable distance, some feel, durable and it appears to get the nod for one more season. Nike TA is the worst ball I have ever played, Strata is decent ball but I am sticking with Titleist, Taylor Made was a real debacle, Callaway didn't get me there either. I recently switched from the TopFlite XL 2000. This ball actually goes longer and ofcourse has better feel around the green. I'm definitely not switching back. This is a great ball for the $$. It provides the low trajectory and extra distance that I wanted. Great in the wind - bores right thru. Stops well on the soft greens in the PacNW. I gained 10 to 15 plus yrds with my Orlimar 9.5 driver(275 yd avg)and 14 fairway wood. Long irons gained similar distance. Putts very true. Ball held up thru five rounds. As a 12 handicap this fits very well in my game and my budget. I will be hitting the par 5s in two instead of laying up. I give this ball a 4 star rating just because it does what it should. It is a distance ball that flies straight with low spin. Durability is good. To be expected, it is very hard and might not hold every green. Overall, a good value! In terms of price, durability, distance and low spin rate, this is undoubtedly one of the best ball out there on the market. Period. Yet one can draw or fade at will. Around the green, there is plenty of feel, perhaps not as much as HP Tour. The distance I get off the tee is about 10 to 15 yards shorter than the Pinnacle Extreem. I find the cover just a mite less durable than the Extreem, but then, who wants to hit rocks. The Pinnacle Gold LS seem pretty close to the DT Distance in every aspect, and at a lower cost. My pick is still the DT Distance (PTS Distance in other parts of the world... dunno why?) anyday. None, except that they confirmed that DT Distance and PTS Distance (sold elsewhere other than the US, are one and the same ball. Titleist HP Tour, Pinnacle Gold LS, Pinnacle Extreem Distance.